Armchair Fiction presents extra large editions of classic science fiction double novels with original illustrations. 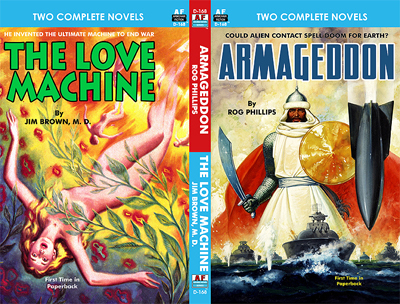 Our first novel is sci-fi maestro Rog Phillips’ wonderful “Armageddon.” It’s a can’t put down kind of science fiction tale. Millionaire Ben Hess would have never thought he would come in contact with a stranger-in need like Fred Gibbs on the side of the road. Furthermore, Hess never would have imagined that, after picking Gibbs up and offering him job, the two of them would bump into a brother and sister scientist team illegally working in secret on Hess’ private airfield. What were they working on? A new-fangled spaceship that could carry man to the farthest reaches of the solar system. That’s when Ben Hess got dollars signs in his eyes. But building a spaceship and flying it into the wilds of outer space can sometimes bring unintended consequences, and soon these four space pioneers found themselves in the middle of an interplanetary dispute with the fate of Earth hanging in the balance… The second novel is an usual sci-fi thriller, “The Love Machine” by Jim Brown, M. D. Was it possible the end of war could begin with…love? It was the time of a new graduating class. Andy Lang—Second Lieutenant Andrew Lang—was one of those newly graduated officers. As a brilliant student, working on his psycho rating, he was published in a military journal…that got the attention of the “Old Men!” As soon as he was assigned to the Arizona re-processing center, Lang was recruited into the Research Branch of the Psycho Corp. There he joined the “Old Men” in unrestricted research, with virtually unlimited funds. So he invented a machine to end the war… The Generals were amazed with the field tests of the Love Machine and approved its use. Attached to the most powerful radio tower in the hemisphere, the machine would bombard the Enemy with a signal that would “cripple” them…at least theoretically!